American aviator Charles Lindbergh became famous after making the first solo nonstop flight across the Atlantic Ocean. He was criticized for insisting that the United States should not become involved in World War II. Charles Augustus Lindbergh was born on February 4, 1902, in Detroit, Michigan, the only child of Charles August Lindbergh and Evangeline Lodge Land Lindbergh. His father was a congressman from Minnesota from 1907 to 1917, and his grandfather had been secretary to the King of Sweden. Lindbergh spent a great deal of time alone while young, with animals and then machines to keep him company. After attending schools in Little Falls, Minnesota, and Washington, D.C., Lindbergh enrolled in a mechanical engineering program at the University of Wisconsin. Lindbergh became bored with studying; he was more interested in cars and motorcycles at this point. He left Wisconsin to study airplane flying in Lincoln, Nebraska, from 1920 to 1922. He made his first solo flight in 1923 and thereafter made exhibition flights and short trips in the Midwest. He enrolled in the U.S. Air Service Reserve as a cadet in 1924 and graduated the next year. In 1926 he made his first flight as an airmail pilot between Chicago, Illinois, and St. Louis, Missouri. Lindbergh wanted to compete for the $25 thousand prize that a man named Raymond Orteig had posted for the first person to make a nonstop flight between New York and Paris, France. With money put up by several St. Louis businessmen, Lindbergh had a plane called the Spirit of St. Louis built. On the first lap of his flight to New York, he traveled nonstop to St. Louis in fourteen hours and twenty-five minutes—record-breaking time from the West Coast. On May 20, 1927, Lindbergh took off in his silver-winged monoplane (a plane with only one supporting surface) from Roosevelt Field in Long Island, New York, bound for an airport outside Paris. Better-equipped and better-known aviators had failed; some had even crashed to their death. But Lindbergh succeeded. He arrived on May 21, having traveled 2,610 miles in thirty-three and one-half hours. He immediately became a hero and received many honors and decorations, including the Congressional Medal of Honor, the French Chevalier Legion of Honor, the Royal Air Cross (British), and the Order of Leopold (Belgium). During a tour of seventy-five American cities sponsored by the Daniel Guggenheim Foundation for the Promotion of Aeronautics, he was greeted by wild demonstrations of praise. In December 1927 Lindbergh flew nonstop between Washington and Mexico City, Mexico, and went on a goodwill trip to the Caribbean and Central America. During one tour he met Anne Spencer Morrow, the daughter of the U.S. ambassador (representative) to Mexico. They were married in 1929. The Lindberghs made many flights together. In 1931 they flew to Asia, mapping air routes to China. Two years later, in a 30,000-mile flight, they explored possible air routes across oceans. resulted in laws that expanded the role of federal law-enforcement agencies in dealing with such crimes, including allowing the government to demand the death penalty for kidnappers who take victims across state lines. The Lindberghs moved to Europe after the execution of their son's murderer in 1935. While in France Lindbergh worked with Alexis Carrel (1873–1944), an American surgeon (medical specialist who performs operations) and experimental biologist who had won the Nobel Prize in medicine in 1912. The two men perfected an "artificial heart and lungs," a pump that could keep organs alive outside the body by supplying blood and air to them. In the late 1930s Lindbergh conducted various studies of air power in Europe. He toured German aviation centers at the invitation of Nazi (a political party that controlled Germany from 1933–45 and that attempted to rid the country of Jewish people) leader Hermann Göring (1893–1946), becoming convinced that the Nazi military was unbeatable. Also in the 1930s Lindbergh was on the Board of Directors of Pan-American World Airways. In 1939 he studied American airplane production as special adviser on technical matters. He also performed promotional work for aviation during this period. Just prior to World War II (1939–45; a war fought between the Axis powers of Germany, Italy, and Japan and the Allies of England, France, the Soviet Union, and the United States), as a member of the America First Organization, Lindbergh warned that United States involvement could not prevent a German victory. He was criticized by President Franklin D. Roosevelt (1882–1945) for radio broadcasts urging America not to fight in "other people's wars." 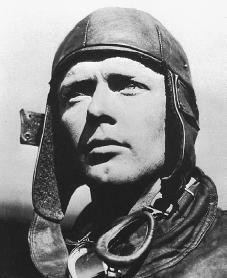 As a result, Lindbergh resigned his commission in the U.S. Air Force. After Japan attacked the United States in 1941, Lindbergh supported the American effort, serving as a technician for aircraft companies. After the war he once again became a technical adviser for the U.S. Air Force, and eventually he was again commissioned a brigadier general in the Air Force Reserve. Lindbergh's association with the Nazis had severely damaged his reputation, but the popularity of the books he and his wife wrote helped restore some of what he had lost. Lindbergh wrote several accounts of his famous 1927 flight. We (1927) and The Spirit of St. Louis (1953), for which he received the Pulitzer Prize for biography, are descriptions of his early life and accomplishments. With Carrel he coauthored Culture of Organs (1938), and in 1948 he wrote Of Flight and Life. Lindbergh's later works included The Wartime Journals of Charles A. Lindbergh (1970) and Boyhood on the Upper Mississippi: A Reminiscent Letter (1972). An Autobiography of Values (1977) was published after his death. Toward the end of his life Lindbergh grew increasingly interested in the spiritual world and spoke out on environmental issues. He spent his final years with his wife in a house they had built on a remote portion of the island of Maui. He died there on August 26, 1974. After her husband's death, Anne Morrow Lindbergh continued to publish books of her diaries and letters. She retired to Darien, Connecticut, where a series of strokes weakened her. In 1992 she discovered that a woman whom her children had hired to manage her affairs was stealing money from her. The state of Connecticut joined with the Lindbergh children in pressing charges against the woman. Bak, Richard. Lindbergh: Triumph and Tragedy. Dallas: Taylor, 2000. Giblin, James. Charles A. Lindbergh: A Human Hero. New York: Clarion Books, 1997. Kent, Zachary. Charles Lindbergh and the Spirit of St. Louis. Parsippany, NJ: New Discovery Books, 1998. Lindbergh, Charles A. The Spirit of St. Louis. New York: Scribner, 1953. Reprint, 1998. Mosley, Leonard. Lindbergh: A Biography. Garden City, NY: Doubleday, 1976.
those are the answer for the work in english. So take good care of the them o.k. I am continually comforted that his gravesite is such a serene site. He and his family deserve such a remote/pristine place to contemplate his deeds. This did help but, there should be more information about his wife, where they met, what age they were. And you should have more information about the kidnapping! For crying out loud, his son was kidnapped!! You have only two sentences on when he was killed and just plain information that I can't use for my research project. I don't mean too be hateful but, I wish this website would have been more useful. Who created the article I need it for a work cited page.